The newly revised and updated third edition of this book teaches beginning analysts and students the art of using numbers for practical problem solving, revealing tools, tricks, and heretofore unwritten rules that the best real-world problem solvers know by heart. 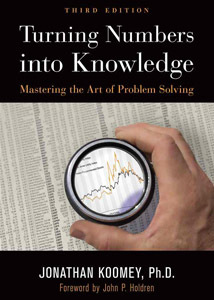 Mastering the art of problem solving takes more than proficiency with basic calculations—it requires understanding how people use information, recognizing the importance of ideology, learning the art of storytelling, and acknowledging the important distinction between facts and values. This beginner's guide addresses these and other essential skills. Turning Numbers into Knowledge is a double award winner in the 2018 Next Generation Indie Book Awards, a double award winner in the the 2018 Global eBook Awards, and a silver medal winner in the 2018 eLit eBook awards. The book also received double honorable mentions in the 2018 Hoffer Book Awards and was a finalist in the International Book Awards. Want a single copy? We recommend you buy it from Amazon, Barnes and Noble, or another fine bookseller.